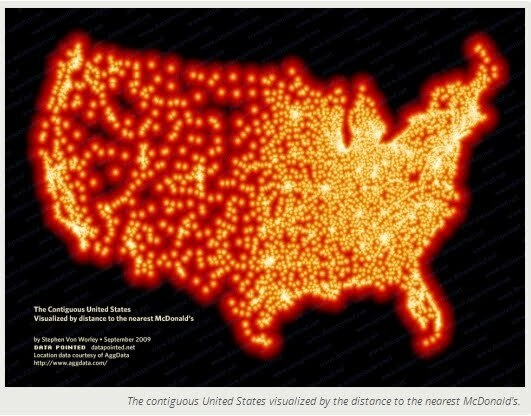 Here's an interesting link from SurvivalBlog which maps all the 13,000+ McDonalds in the continental United States. It's called Where The Buffalo Roamed: How Far Can You Get From McDonald's? by Stephen Von Worley. That picture is crazy! I live in the Chicago suburbs and in my town alone there are 4 and there are 13 within ten miles. That's insanity! The closest Mickey D's is more than 55 miles away from us. At night when the sign is lighted, I can see the arches from the backyard...across the wheat field...3/4 of a mile away as the crow flies. Neighbor, that's too close! At our house we declare loudly, "McDonald's does not exist!" as we strive to stay out of the drive thru. Oh, but wait...what's that I hear? It's the call of Pizza Hut, Little Caesar's, Mazzio's Pizza, Arby's, Braum's, Burger King, Kentucky Fried Chicken, and Taco Bell. Is it any wonder that we call it "The Magnificent Mile of Meals?" About 27 miles away, north or south. Don't really care, their food is gross as is most of the fast food. We did used to have an A&W about 6 miles away, but it left 3 years ago. I've forgotten what a McDonald's french fry tastes like, but man, I did love me some of those back in the day! Moderation in all things, but when it comes to fries...GANGWAY! Once I start, I can't stop, so I don't start. I don't know about anyone else, but I find that kind of nauseating...for more than one reason. Apparently Mr. Van Worley has never visited the great state of Washington. Here on the western peninsula we have vast areas where we can drive for hours and hours and hours without ever seeing (or smelling! )a McDonald's in any form. I love it. And a btw for Save the Canning Jars....didn't you mean to say Tina Fey instead of Sarah Palin? It was, after all, Ms. Fey and not Governor Palin who made the insipid remark you alluded to in a Saturday Night Live skit. To A McSp: Oh, I'm sorry! My bad (as the younger generation would say!) I did not mean it as an insult in ANY way. I've been trying to leave word for you that I've been making and canning your chicken stock and have enjoyed in tremendously! Can-jars you are a girl after my own heart. Last night as I was putting some chicken stock into something I was cooking for supper I thought of you and wondered if you're using lots of it, too. No offense taken on the Sarah comment. I'm a big supporter and am pretty quick to speak up for her. She's the real deal. I wish we could get together for a canning marathon! We'd put up so much chicken stock no yard bird in the country would feel safe. Mc D's & Walmart are 1 in the same in my book. Cheap and disgusting. We did a major dietary change in our family and in a tight spot with family outing stopped for McD's. I regret it wholeheartedly. It made DS violently ill, and me as well... gastrointestinally speaking. NEVER again. DISGUSTING. In the past, our big white dog developed an allergy to corn (both fresh or any corn found in commercial dog foods). He would scratch his skin raw and shake and shake his ears. We switched to expensive specialty brands that contained no corn and that bought us a year. Finally he could tolerate no commercial brands no matter how expensive or specially prepared. And I was left with...I don't remember if it was 200 or 300 plus pounds of dark meat...taking up space in both my freezer and mom's freezer and WE DON"T LIKE DARK MEAT! But being one not to waste, I decided we were going to learn to like it! The "putting up process" works best when I tackle only 10 lbs. at a time, thawing the leg quarters overnight in the fridge, then baking them until almost done, de-boning and packing into pint jars, filling with hot water that has added to it Shirley J Chicken Broth granules (no MSG and great tasting). While the jars of dark meat chicken pressure can, I start making the stock from the bones and skin and cook it for about 4 hours (sometimes longer). After it gels up in the fridge overnight, I skim the fat that next day and return it to a hard boil, strain, then ladle and process in quart jars and pressure can to complete. By then another 10 lb. package of chicken is thawed and the process starts all over again. And we really do like that chicken after all! It is so tender from the pressure process. Bless the Lord...we've got a chicken cannery going on over here! I believe that if we will be faithful with the little (such as not wasting even the bones), God will allow us to be faithful with the much! So without you and Patrice, I would never have had access to your great recipe! Hugs to you both! I'm thrilled you're putting that recipe to such good use. I bet your house smells heavenly and welcoming. I'll have to look for some Shirley J stock granules. That sounds like a real handy thing to have around.